I remember when the new year meant hanging a new wall calendar, or training myself to write a different digit on my checks when I paid my bills. Thinking back on these behaviors feels so 1999 to me. 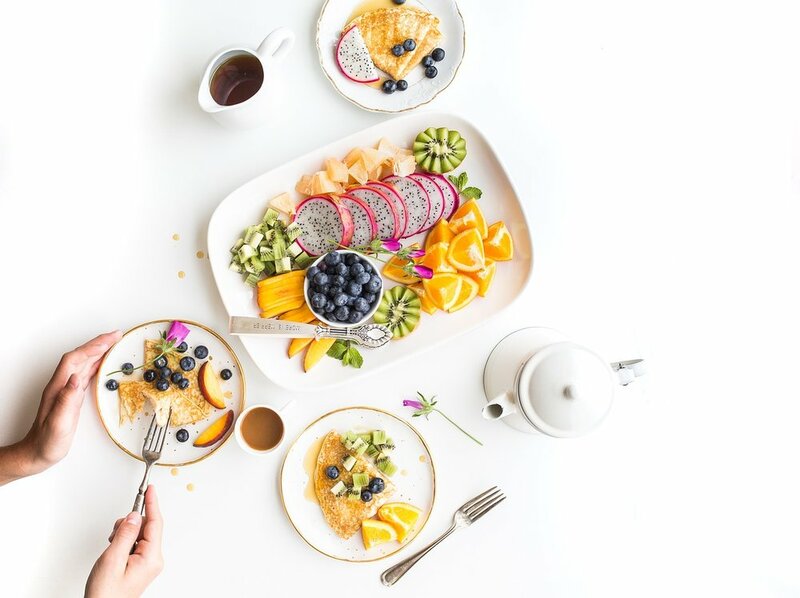 But some things don’t change at the start of the year, most notably that an overwhelming number of people (some studies say as many as 1 in 5) vow to change their diet in some way, whether to lose weight, improve their health, live a more ethical lifestyle or simply to feel better in this embodied experience. We all know the statistics about keeping resolutions are pretty grim. By some accounts I’ve seen, less than 8% of resolution-setters actually spend more than a month working towards their goals, with many fewer actually seeing their intentions through to successful fruition. In my experience, there are a host of factors contributing to these dismal statistics, including our approaches to discipline, and how we manage stress and accountability in our lives. There are plenty of tools, books and apps to help with being more dedicated to our intentions. But, where I find there is less focus is on the quality of the goals we set, especially in the space of diet-related resolutions. I believe the majority of resolutions fail not because of a lack of willpower, but because we target things that are not actually the root cause of the suffering we wish to overcome. The majority of food-related resolutions are focused on what we eat. We make declarations that we will swear off sugar, animal-products, processed foods, midnight snacks, (fill in the blank), etc., etc. We promise ourselves we will put less food on our plates. We declare we will cook more of our own food, rather than leaving it to others. We believe that by eliminating, adding, shifting what we put on our plates, we will lose weight, have clearer skin or a less foggy mind, sleep better, be happier or achieve some other desirable state of being. To be clear, there is nothing inherently wrong with this approach. I’ve seen people I know achieve radical health and wellness results by shifting their diet, and I wholeheartedly endorse a mindful approach to what we put into our bodies. But where I think so many people miss the mark is that they assume that food is responsible for whatever undesirable results they are seeking to transform. And the truth is, there is so much more that we bring to the table than simply our food. We’ve all been eating since we were born, and what we have eaten has naturally shifted over time as we have grown older and more aware, and become more attuned to our inner world. For most of us, other than perhaps some basic training in the mechanics of a fork and spoon, no formal training was provided on how to eat. And yet, the people we grew up with­ – in our own homes, and in our society more generally – likely had a profound impact on how we look at and relate to food. If we grew up in a home with a parent who loved to cook from scratch and had a healthy relationship to food, our relationship with food is quite different from that of someone who was raised in a home where food came out of takeout boxes and restrictive dieting was the norm. People raised in the US and many Western European nations are far more likely to have had exposure to disordered eating in their peer groups as a teen and young adult than people raised in developing countries, and this may strongly shape their beliefs around food, even if they did not fall prey directly to such habits. I’m not saying we can’t overcome our food histories and write new narratives around food for ourselves, but it is time we start acknowledging them and realizing that we bring them to the table each time we eat. If we perceive food as an enemy, an obstacle, a challenge, that is what it will be for us. If instead, we can come to see food as a gift, our most vital nourishment, we create new stories that have the potential to impact us at the cellular level. When we shift the mindset we bring to the table, we create space for our goals to be realized. We no longer impede healthy digestion and assimilation with so many worries or stress. If we are carrying anxiety around our food, our weight or how well we’re doing in relation to a goal, we may be sabotaging ourselves, regardless of how healthy the food on our plate is. Because we have accumulated so many stories and experiences around food over the years, it’s important that we begin to approach food more as a relationship than a thing external to who we are. And beyond that, we need to see this relationship as an intimate one­ – we are, after all, taking food into our bodies, assimilating it and living off its energy. It doesn’t really get much more intimate than that! It’s not uncommon to seek help in relationships, especially when we feel we are struggling. A key part of relational work is uncovering what we each bring to a relationship and what we are seeking. We would benefit greatly by approaching our food relationships in the same way, uncovering our histories and getting truthful about when and why we eat. Blaming food for our issues is like blaming the other person in a relationship. It’s not effective and we keep experiencing the same patterns of struggle and disappointment. When we shift who we are in relation to food, the real potential for transformation and healing happens. Best of all, in my experience, the issues we bring to the table tend to permeate all areas of our lives. If we see ourselves as victims of food, we probably are writing victim narratives for ourselves in other relationships too. If we tend to be overly controlling with our food and the portions we put on our plate, we probably are wearing ourselves out trying to control so many other things in our lives (including a lot of things we cannot control). You get the picture. By getting honest about who we are as an eater and seeking to transform any unsupportive behaviors we are bringing to the table, we create space to transform all our relationships. I’m personally excited to delve more into the relational aspects of eating this year, and look forward to sharing more in writing and in person. I’m also launching a new offering: Food Relationship Coaching sessions, in which we’ll uncover your inner food narratives and begin to rewrite new scripts that serve your fullest health. These sessions are for everyone, whether food feels like something you struggle with or not. If you’d like to discover what you’re bringing to the table and find ways to perhaps shift some beliefs or habits that may be setting you back, contact me for a discounted introductory discovery session! There’s a saying that you can pour the purest golden nectar into a chalice, but if the cup is dirty on the inside, then the quality of the nectar is irrelevant. When it comes to food and your body, the same is true. You can eat the freshest, high-quality whole foods but if your digestive system is not in good shape, then your ability to process and assimilate the nutrients from your food is severely compromised. This is a key reason why Ayurveda and most other healing systems place such a strong focus on creating and maintaining a healthy gut. This week, as many people focus on making changes to what they are eating, I am offering a five-part series on simple ways to boost your digestive capacity so that you can more optimally process the healthy foods you are consuming. Today’s tip sounds simple but can be quite hard to enact: slow down while you eat. The key here is to chew each bite thoroughly. Our mouths are not just receptacles for receiving food, but also the starting place for the digestive process. When we chew food well, we break down cell walls and prepare foods for the journey ahead, where they get broken down even more. As we chew our food, we mix it with our saliva, which is full of enzymes that facilitate digestion. In other words, the more we chew, the more primed our food is to be broken down and absorbed thoroughly. If you’re prone to eating fast, it can be hard to slow down. The best way to put this tip into action is by committing to putting down your fork/spoon (or setting down handheld foods) between bites. Many of us have what I call “next bite syndrome,” where we are constantly preparing our next bite on our eating utensil before we’ve even chewed the food in our mouth. When we do this, we are more likely to plop the next bite in before we’ve thoroughly swallowed the previous bite. If you practice slowing down regularly, you may just find you enjoy your food more too. When we eat mindfully, we have greater opportunity to tune into the unique flavors and textures of our food. Give it a try at your next meal. And of course, be compassionate with yourself…it’s okay if you fall into normal habits, just commit to slowing down with the next bite. Each bite is a new opportunity to slow down and be mindful.